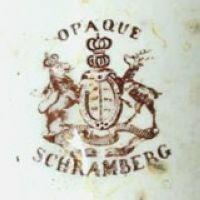 The Schramberg pottery was founded during 1820 by the stoneware expert Isidor Faist, who actually was born in Nordrach (Baden-Württemberg). 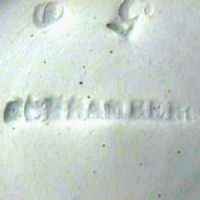 His business was the first stoneware factory in the Württemberg area and the location had been carefully chosen. The surrounding area offered all he needed: the empty Schramberg castle offered enough room for production and the surroundings offered good raw materials as well as enough wood for firing the kilns. In addition, the near river Schiltach offered another source of energy and of course water. And cheap labour was at hand as the area around Schramberg was poor and workers were easy to get. 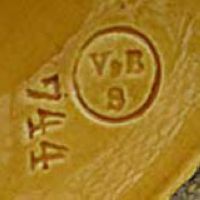 After a few years, the pottery had a good reputation and Faist was able to convince the Baron Ferdinand von Uechtritz to join him as partner. With financial help from the Baron, Faist was able to build a new factory behind the castle, which drastically increased output. During the 1860's the factory had a constant workforce of 100 people and an impressive number of nearly 6,000 home workers (decorators, etc.) which were mainly children and women. 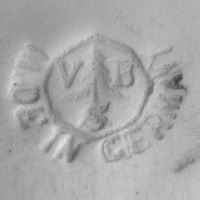 Faist from 1882 on took in many orders from Villeroy & Boch and after having literally worked for them around a year finally sold the pottery to Villeroy & Boch in 1883. 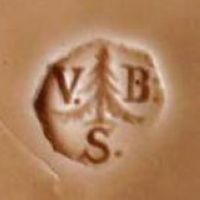 As a subsidiary of the ⇒Villeroy & Boch company in Mettlach (Saar Basin) the factory continued operation until 1912 and was famous for its majolica and other forms of earthenware, even though the factory was not one of the main 'Villeroy & Boch' factories. But during 1911 various buildings of the factory were demolished to make way for the local railway and as that drastically reduced output, Villeroy & Boch lost interest in the location and it was put up for sale. 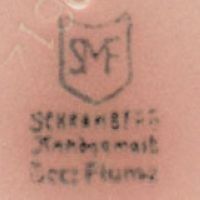 In 1912 the factory was sold to the Jewish brothers Moritz and Leopold Meyer, who introduced the 'SMF' mark in its first version including a fir tree. The business was a normal privately owned business until the brothers decided to reform the business as a company with limited liability, so it was restructured as ⇒G.m.b.H. in 1918. All went well for the next years and on March 12th 1922, Moritz Meyer proudly announced the birth of his son Peter. The Meyer brothers were always looking for new designs and many famous artists joined the factory or contributed designs. 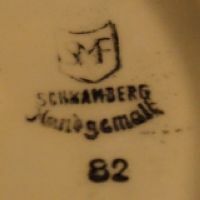 One of these well known artist was the Hungarian Eva Zeisel (maiden name Stricker), who designed at Schramberg from the fall of 1928 until the summer of 1930. Most of these designs were not produced immediately, but began appearing in 1930 and the subsequent years. Her earlier works there were strongly influenced by the then-strong Bauhaus movement, but she always followed her own impulse to combine the needs of the marketplace with the human component. 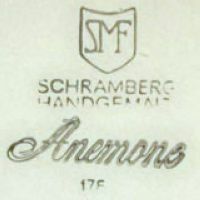 Hence her Schramberg work often seems of the art-deco school, but also reflects the folk art interest of her earlier work, and the industrial factory requirements of the various factories for whom she designed. Eva Zeisel not only designed the shapes but also supplied the intended decorations for the pieces. The decoration department however often adapted her original concepts and applied them to other pieces. For example, a pattern intended for use on a plate would change proportions if wrapped around a cup or teapot, so Zeisel would sometimes feel the design was not exactly as she had conceived it. The factory continued producing Zeisel designs for some time after she left, but often put different patterns on her shapes and also used her patterns on shapes which were not hers. This happened particularly with the wildly popular 'Mondrian' design, which often appears on non-Zeisel shapes. During the upcoming anti-jewish movement shortly before World War II, the Nazis forced Moritz and Leopold Meyer to sell the factory in 1938 and both emigrated to England with their families during 1938. But after the war, in 1949, Peter Meyer returned to Germany together with his family and the Meyer family was instantly allowed to take over the business again. After years of hard work rebuilding the damaged factory Peter married Julie Broghammer in 1958 and together they had two children, Annette and Michael. In 1970, Peter Meyer became sole proprietor of the factory and continued the work of his father and uncle for the next ten years. On December 6th 1980 Peter Meyer died from complications after a heart attack and during the following years the factory was led on by different directors but with much less success. His workers even said that the heart and soul of the facility had died with Peter Meyer. In 1989 the factory was finally closed and the area was cleared to make room for new industry, today the former main building contains the head office of the newly founded industrial center. Impressed 'SCHRAMBERG' used between 1820 and 1883. Some sources indicate use between 1938 and 1949 so I'd be cautious with this one. Applied for in 1861 and after receiving permission in 1862 used on some series until 1882. Used between around 1883 and approx. 1900. Used between around 1883 and approx. 1900, here with 'MADE IN GERMANY' addition. 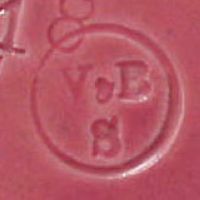 Used between around 1883 and 1912. 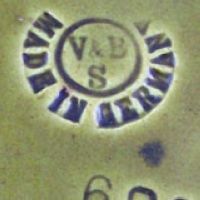 Claimed to have been introduced 1905, basically same as before but with 'MADE IN GERMANY'. 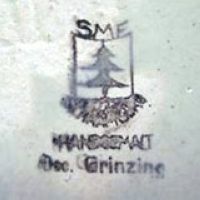 Used between 1912 and 1918, 'SMF' over a shield with a fir tree over 'SCHRAMBERG' over 'HANDGEMALT' and 'DEC. GRINZING'. 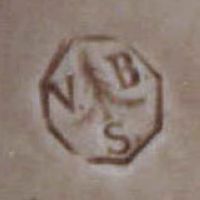 This simple 'SMF' on a shield over 'SCHRAMBERG' was registered at the ⇒R.W.Z.R. under file №·226·288 on September 20th 1918. 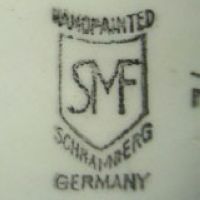 No date known, 'SMF' on a shield over straight 'SCHRAMBERG' and curved 'HANDPAINTED'. 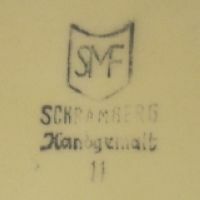 No date known, 'SMF' on a shield over 'SCHRAMBERG' over 'GERMANY'. 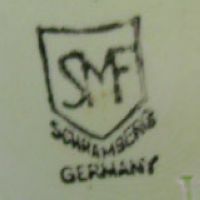 No date known, 'SMF' on a shield over 'SCHRAMBERG' over 'GERMANY', all topped by 'HANDPAINTED'. 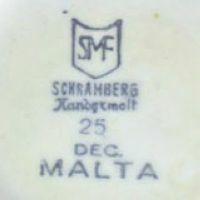 No date known, 'SMF' on a shield over 'SCHRAMBERG' over 'HANDPAINTED'. 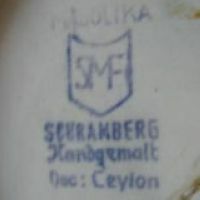 No date known, 'MAJOLIKA' over 'SMF' on a shield over 'SCHRAMBERG' over ⇒HANDGEMALT. 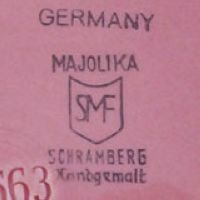 No date known, 'MAJOLIKA' over the shield above 'SCHRAMBERG' over ⇒HANDGEMALT. and 'DEC. CEYLON'. 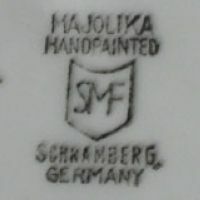 No date known, 'GERMANY' over 'MAJOLIKA' over 'SMF' on a shield over 'SCHRAMBERG' over ⇒HANDGEMALT..
No date known, 'MAJOLIKA' over 'HANDPAINTED' above shield and 'SCHRAMBERG' over 'GERMANY'. 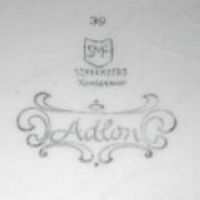 No date known, 'SMF' on a shield over 'SCHRAMBERG' over ⇒HANDGEMALT.. 'ADLON' was the decoration name. 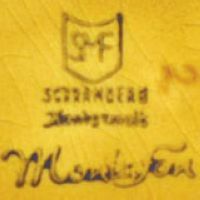 No date known, 'SMF' on a shield over 'SCHRAMBERG' over ⇒HANDGEMALT.. 'MONDRIAN' was the decoration name. No date known, 'SMF' on a shield over 'SCHRAMBERG' over ⇒HANDGEMALT.. 'ANEMONE' was the decoration name. 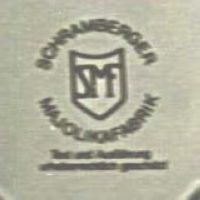 No date known, 'SMF' on a shield over 'SCHRAMBERG' over ⇒HANDGEMALT. over 'DEC:PLUME'. 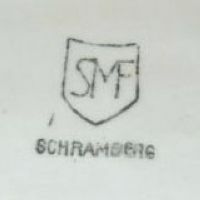 No date known, 'SMF' on a shield over 'SCHRAMBERG' over ⇒HANDGEMALT. over 'DEC. MALTA'. 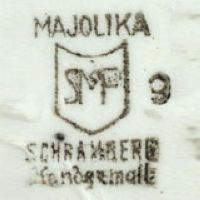 No date known, 'SCHRAMBERGER MAJOLIKAFABRIK' with the notice 'IDEE UND AUSFÜHRUNG GESETZLICH GESCHÜTZT'.